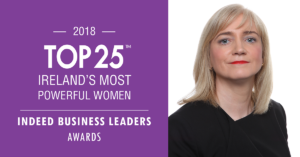 Winthrop are delighted to announce that our very own Anne Dooley was recognized as one of Ireland’s Most Powerful Women: Top 25 Award Winner, an honour celebrating fearless female leaders whose efforts to succeed continue to inspire others. The Top 25 Awards open doors for women to achieve higher levels of excellence by proving that with perseverance and dedication, opportunities increase for all female leaders to have an impact at the highest organizational levels. Ireland’s Most Powerful Women: Top 25 Awards showcase the incredible scope of female leadership talent we have in Ireland and stand as proof of what can be achieved through the pursuit of excellence.